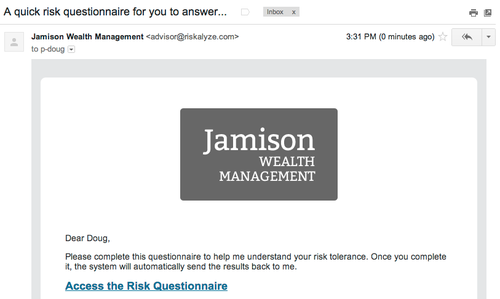 Since Riskalyze Pro launched, our advisors have created hundreds of risk questionnaires, which get sent to their clients via email. We’ve made a change to improve the deliverability of those email messages that we want our advisors to be aware of, and have the ability to change. When a piece of software like Riskalyze Pro generates an email message, it has to set three variables inside the message: the sender’s name, the sender’s email address, and an email address that replies should go to. One of the ways that spam filters try to stop junk email messages is by matching the sender’s email address back to the server that the message is coming from. If there’s no match, that increases the possibility that a given message is spam. So we’ve made an important change. We’ve started setting the “sender’s email address” as advisor@riskalyze.com. We still leave the sender’s name as the name of your firm, and we ensure that all replies go back to your email address. That ensures that spam filters will see a match between the sender’s email address and our servers, greatly increasing the probability of the risk questionnaire being safely delivered to your client’s inbox. Here’s an example of how this looks to your client. Here’s a risk questionnaire email sitting in a Gmail inbox. As you can see, the name of the firm is who the message is from. When the client opens the message, they see it in much the same way, but if you look closely, the sender’s address is advisor@riskalyze.com. And if the client clicks reply to the message, they are immediately composing a message right back to your email address. We won’t receive a copy of that reply, nor will we even know if the client replied. Now, a few questions you might have. What if I absolutely must have the “sender email address” be my address? We can switch your account into “Manual Send” mode. 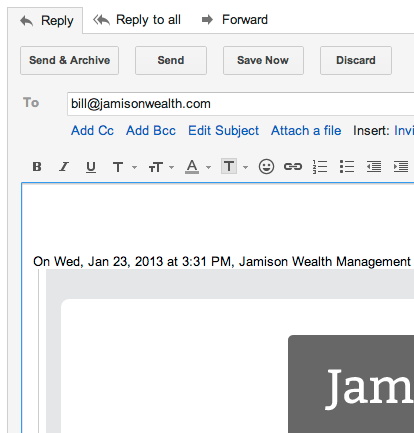 This replaces the “Send Questionnaire” button with the ability to copy and paste the message text and link into your own email program, so you can send the questionnaire to the client like you would any other message. If you’d like us to switch your account into “Manual Send” mode, just make that request to support@riskalyze.com. We’re committed to making Riskalyze Pro be a smooth and seamless part of your client interactions, and this change is an important part of that. If you have any questions or concerns, don’t hesitate to let us know.